Last week we talked about a cool quote by artist Bob Ross. If you missed it, you can find it here. Today we're going to dive a little deeper into Bob's life & work. 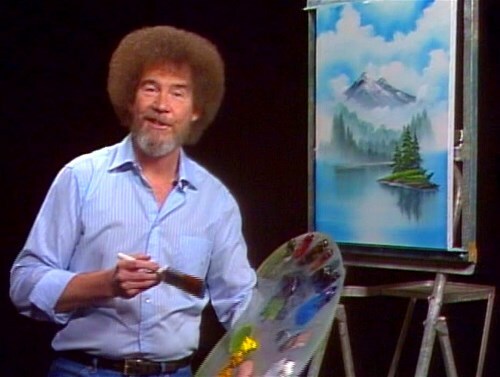 He loved painting happy little clouds & trees, and taught all of us to loosen our grip a bit on that proverbial brush, and just enjoy the creative process itself a bit more. So here's the guy we're going to talk about today. Bob Ross, as many of you know, was not only an artist, but a well-known TV personality "back in the day". From 1983 up until 1994 he had his own PBS show called "The Joy of Painting". The show was immensely popular at the time, and has recently made a resurgence in popularity. Thanks to Youtube & Netflix streaming them for our enjoyment, millions more have now had a chance to watch him do his thing. Bob Ross takes a very chill, relaxing & meditative approach when he's demonstrating, and this appeals to so many who face stresses & pressures in their daily lives. By watching & listening to him, we are all soothed into the realm of creativity, and thus into the present moment. His ability to spark our imagination, and at the same time give us a sense of peace & contentment, is legendary. Unfortunately, Mr. Ross died in 1994 of lymphoma at the young age of 52. But thru his TV show, his testament to the creative process lives on in our lives, giving us more confidence to go out & follow our own creative muse. The reason I chose him for this month's featured artist, is not necessarily because of his body of work. They are good, solid oil paintings for sure - but Bob himself said that he was doubtful his paintings were in the realm of "fine art". Instead, I'm turning the spotlight on him this month because he has inspired millions of people to make something with their hands & hearts - and that matters greatly to me! I know from my own experience, that the more I spend time creating, the healthier & happier I become. And that's where Bob Ross, the painter AND the teacher, takes each one of us when we watch his show. He worked very hard at his craft. 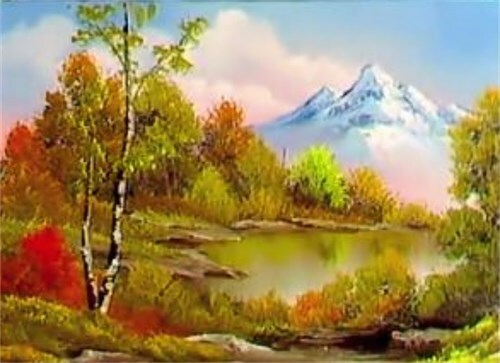 For each of the 403 episodes of The Joy of Painting that he did (which is a heck of a lot of work in itself), he made 3 paintings for each one. The first one was so he could get a feel for what he wanted to do on the show, and he used it off screen as a reference while he was doing the painting during the show (the second painting). And the third he painted after the show while his business partner, Annette Kowalski, took photos that then went into a step-by-step painting book he wrote at the end of each season. 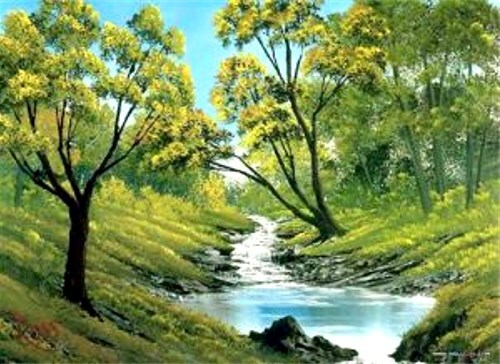 He has said that he painted 30,000 paintings during his career as an artist. He also traveled all over the country for a number of years teaching classes, was a guest on various TV talk shows, and trained many other instructors in his painting method so they in turn could travel & teach on his behalf. As I watched this one hour documentary of his life, one of the people who worked closely with him said this, "He was selling hope as much as he was selling creativity & painting." I do believe that pretty much sums up why he has become the icon he is to this very day. Even if someone watching him paint never picks up a brush, he gives us all hope that if we believe in ourselves, and work hard at whatever it is we love - we will be successful at it!